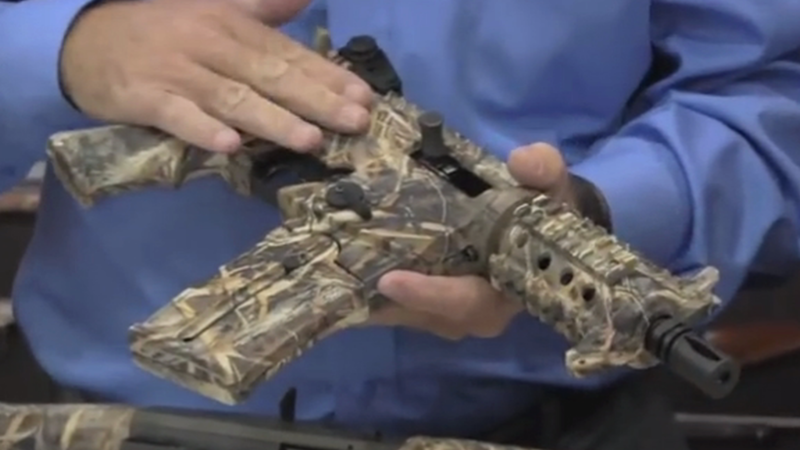 The family-owned business at the center of the hit TV show "Duck Dynasty" has launched its own line of guns. Mossberg has begun shipping some of the shotguns to distributors, according to spokeswoman Linda Powell. She declined to name specific retailers that will carry them. Duck Commander was founded 40 years ago by Phil Robertson, the family patriarch who was recently suspended -- and then reinstated -- by A&E after making controversial remarks about gay people and African-Americans. He and his sons are featured prominently in four video ads for the new guns on Mossberg's web site. Phil narrates one of the spots saying, "Do you know what makes me happy ladies and gentlemen? To blow a mallard drake's head smooth off." "Duck Dynasty" is a wildly popular show that profiles the Robertson family business in Louisiana that sells duck calls as well as hunting DVDs and clothing through Wal-Mart (WMT), Cabela's (CAB), Target (TGT) and other retailers. The brand has already been affixed to everything from action figures and door mats to wine, (produced by the Trinchero Family Estates) as well as books about cooking and religion. A&E, the producer of the show, temporarily suspended Robertson after he made homophobic and racially insensitive comments in an interview with GQ. But A&E lifted its suspension after a few days. Cracker Barrel (CBRL) also did an about-face after the controversy, first pulling Duck Commander merchandise from its restaurant gift stores following Robertson's comments, only to put them back a few days later.